The Shelby County Highway Department awards an annual paving contract to restore various county roads throughout the region. 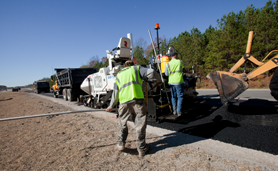 The contract scope typically includes dense graded base, surface treatment, asphalt patching, widening, milling, paving and traffic striping for some 20 miles of road. Dunn Construction served as General Contractor on Shelby County’s 2011 $3 million project—which required that milling be performed before patching and surface treatment, and that surface treatment be covered within 48 hours. Dunn installed over 37,400 tons of asphalt during the project—28,000 tons in one month alone. In complying with additional contract requirements (that all roads to remain open to the public while work was being performed), Dunn utilized the Manual of Uniform Traffic Control Devices—including flagmen, arrow boards and construction signing—along with crews to establish and maintain various partial lane restrictions. Dunn was also challenged with coordinating subcontractor work—which it did, in part, by holding weekly scheduling meetings. In order to maintain its schedule, Dunn performed much of the project’s work at night. The project was completed in October 2011.